Let’s face it. Shopping for a flower girl dress can be tough! But have no fear, WE are here to help! ☺ It’s really not that hard once you have the few important factors down. So if you have a few minutes now, it will save you hours later! Read on for some tips on how to choose that perfect dress for your little flower girl in your oh so special wedding. Trends: For all the stylish brides-to-be, choosing the perfect flower girl dress is essential. First, do some research to find what you like. Flip through a couple bridal magazines, some wedding blogs online or even regular fashion magazines or blogs.Trends can range from colors for a season, fabric combination and trims. At NancyAugust.com, we are always picking up new styles right before the next season arrives so you will always have a selection of stylish flower girl dresses to choose from. Season: The weather and time of year will play a big part in the style of the flower girl dress you pick out. For a spring or summer wedding, opt for a flower girl dress with short sleeves or a sleeveless design and a lighter fabric such as cotton or taffeta. For a fall or winter wedding, pick a flower girl dress with a thicker fabric such as satin or velvet. Also consider a dress with long sleeves to keep your little flower girl cozy as she walks down the aisle! You also want to pick your flower girl dress in accordance with what colors are for the season, just as you did when you set your wedding date. Location of Event: Is your wedding at a beautiful hotel or a beach? Our flower girl dresses would look great at any wedding, but there are some styles and fabric types you must consider. An indoor wedding opens up more options for you when choosing a flower girl dress because you are out of the elements. Go ahead! Pick the most fancy dress made of the most elegant satin or silk dress with layers of taffeta and tulle! An outdoor wedding, most of which are held during the spring, summer and early fall means staying away from thick, heavyweight fabrics and a mid-calf or tea length dress so the hem will not drag on the ground and become dirty. Consider light and airy colors and a simpler design. Going more natural with your flower girl dress can be just as beautiful as a fancy dress for an indoor wedding! Budget: We all know that in planning and setting up your wedding, you have a budget that you have to follow as getting married can cost a lot of money. If money becomes an issue when choosing which flower girl dress to buy, you can look at purchasing her dress online or you can just buy her a nice party dress. If you choose to shop online for your flower girl dress, you can find a lot of great deals because shopping online can be much cheaper than buying in a bridal shop. You can potentially save up to 70% off the retail price for virtually the same thing! NancyAugust.com provides the most affordable flower girl dresses of the best quality. Our selection includes a wide variety or colors, styles, fabrics, and accessories. If you are on a very tight budget, go with a simple white flower girl dress and pick out a sash that ties in with your wedding theme colors. It is a beautiful, classic style and because the sash can be changed out, your precious angel can wear the dress more than once or better yet hand it down to her little sisters! We have a lowest price guarantee, free shipping on orders of $125 or more and a 10% off promotional code for first time buyers! Between you and me the code is "NAFIRSTX". Theme: Is your wedding themed? Romantic, Modern, Bohemian, Fairytale, Vintage or Rock and Roll? Shopping online will give you the widest selection of dresses. NancyAugust.com has classic whites, lace, cute floral beading and sequins, princess style gowns, simple and modern silhouettes, pastels, bright and rich colors and so much more. 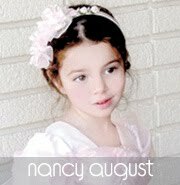 At NancyAugust.com you can find the perfect flower girl dress for your wedding and even customize it with your choice of additional colored sashes, headbands, tiaras, shoes, tights, socks and flower pins! Click here to start shopping for your flower girl dress! Kids Holiday Dresses and Fun Activities! Enchanting Holiday Dresses Are Here!